The previous post started with Trollope’s commentary on how the finance system worked in the C19. In a wholly unplanned segue, this one deals with how economics is taught and practised now. 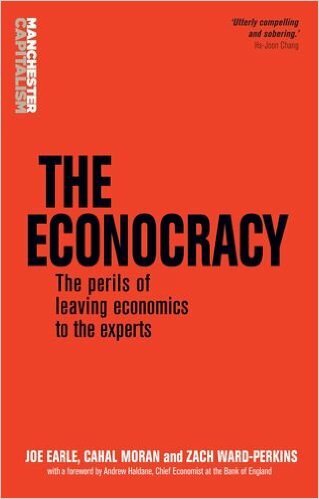 To their immense credit, a group of students have got together to produce a detailed, evidence-based critique of the discipline: The Econocracy: the perils of leaving economics to the experts. Rethinking Economics is a movement which questions the assumptions on which most contemporary economics courses are based. To be more precise, it challenges the fact that most economics courses never question their own, neo-classical, assumptions: that people behave as rational knowledgeable agents seeking to optimise their own advantage, and that the system always tends to equilibrium. The movement involves many different groups in universities across the UK and in many other countries. Now an RE team have published a book on how economics is taught and examined. They analyse the questions asked in the tests (coursework and exams) in seven Russell Group universities, and find that the vast majority involve no critical thinking. Instead, students are required to reproduce descriptions of theories or solve mathematical problems. Many of the tests are multiple choice (the book describes how the economics of higher education means that universities increasingly favour multiple choice as a cheap way of examining students). Very rarely – in less than 10% of the tests of compulsory economics modules – are students asked to engage the kind of critical thought involved in an appraisal of different economic approaches or a historical assessment of events. The book is polemical, but not a rant. In fact the authors stress again and again that they are not against neo-classical economics; they simply reject its wholesale dominance of economics teaching, and argue for a more pluralistic approach. Tellingly, they point out that Hayek would be as shocked as Keynes and Marx at the narrowness of the curriculum. I found a twofold relevance in the book to the Paula Principle. The first, predictably, is that the great majority of university economics teachers are men. I don’t think the authors make this point explicitly, but the gender bias is probably linked to the mathematicisation of the discipline: the withdrawal to the world of abstract formulae and the ignoring of real life. Econocracy is a very male affair. Secondly, the RE team asks questions about the criteria used to assess economic performance. Environmental economics struggles to gain a foothold, for example; and in so far as it does, environmental issues are subjected to narrow kinds of calculation using the same framework of individual choice and cost/benefit. The particular PP-relevance is to do with trade-offs between consumption and free time. The dominant neo-classical framework cannot give a properly nuanced account of how women and men follow particular patterns of paid and unpaid work – and how these might change. This is a fundamental issue, especially today when so many people work ‘unconventional’ hours. Understanding both the variety of individual preferences and the factors that shape those preferences is a real challenge. The RE team show how inadequate economics as it is conventionally taught is to meet that challenge.